The great thing about an all-world collection is that you don’t necessarily have to stick to country collecting, or at least storing your stamps by country. 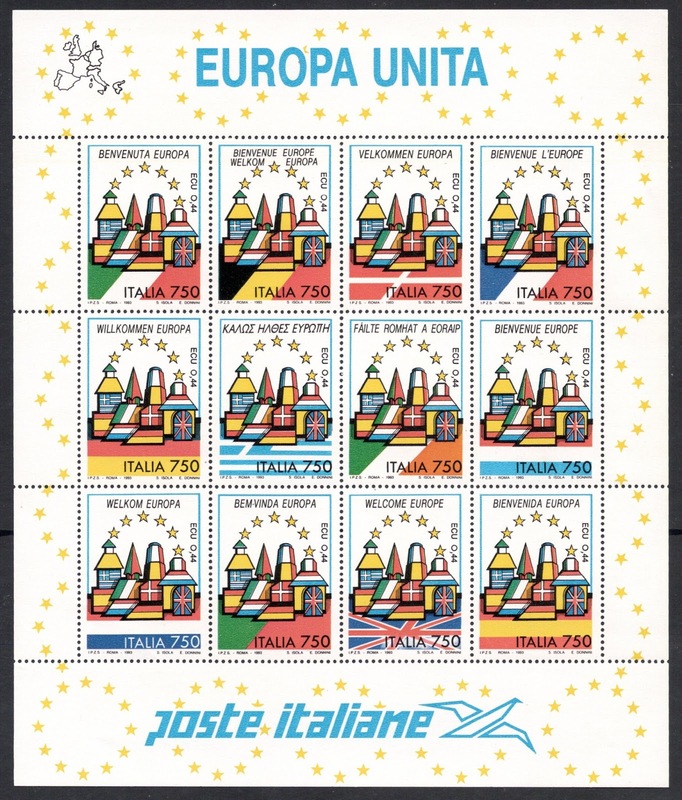 When I wrote my previous blog on the stamp centenary issues, I suddenly got this idea to take it a bit further and sort my collection by year rather than by country. That way, you get a lovely flow in your collection from old to new and the history of the world (and that of printing!) passes you by at the same time, so it still feels like a proper collection rather than just stamps having been put together willy-nilly. Major events in the world get grouped together rather than being spread around among I don’t know how many countries. The advent of the European Union, for example, is a very good illustration of this point. The European Single Market was agreed upon in 1992, and the twelve member countries all issued a stamp to commemorate this event. When collecting by year, you could file all twelve of them together under 1992, giving the issues, all existing of a single stamp, much more emphasis than they would get in a regular country collection. All designs are based on the yellow European stars but it’s good to see that this image has been incorporated in many different ways. Look at this Irish stamp for example. 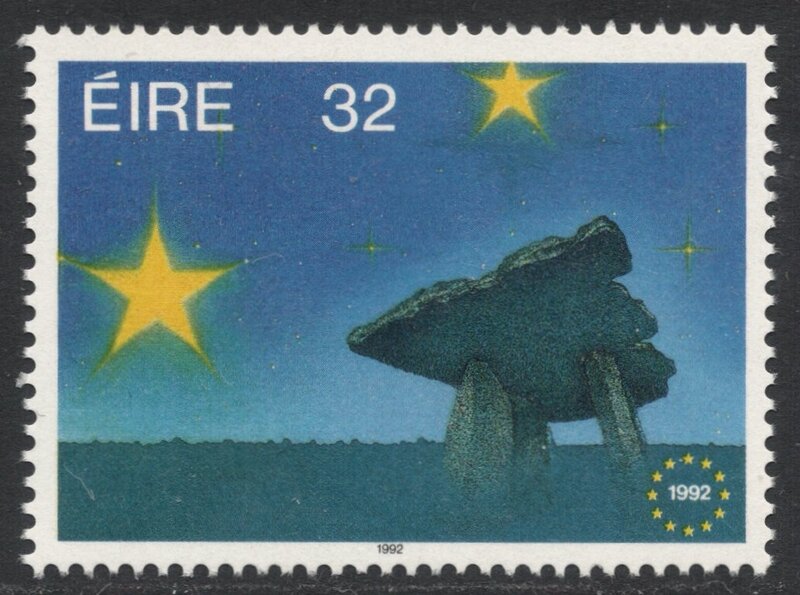 It places the European stars in the sky above a typically Irish landmark of a dolmen, thereby symbolising both unity and individuality at the same time. The British stamp, designed by none other than David Hockney, to me feels like Britain being the only European star with sea borders all around. It’s kind of odd but iconic as well, so I’d still give it the thumbs up. I’m less certain about the Danish design, however. Described as ‘Abstract’ in the catalogues - now there’s an understatement if ever you saw one – I’m not sure what to make of it at all. 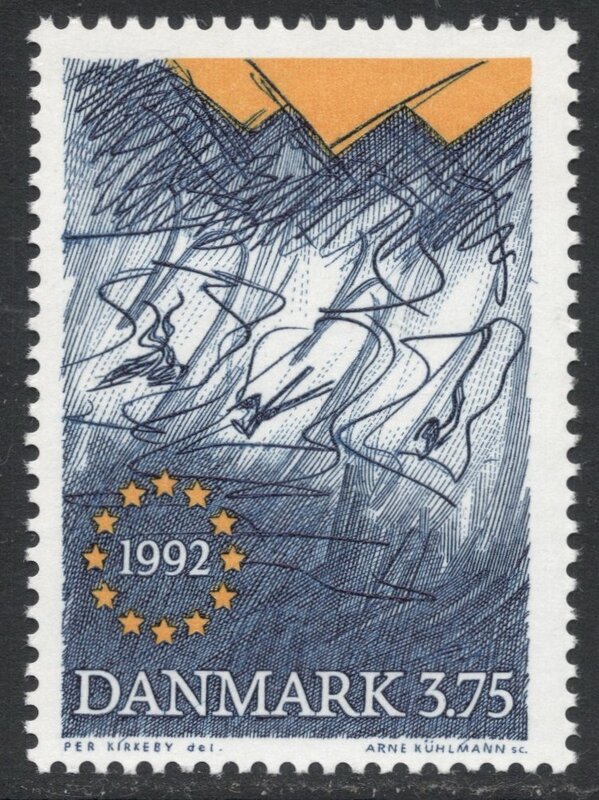 The Scandinavian catalogue does not make it any clearer, by merely stating this is an abstract with ‘star teeth’. Oh well. 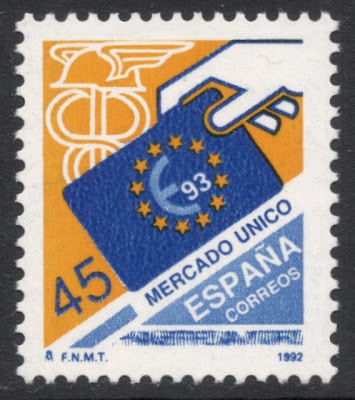 Very much more ordinary, and less original, is the Spanish stamp, but I like it because it is on a small, definitive-size format, which somehow always appeals to me. 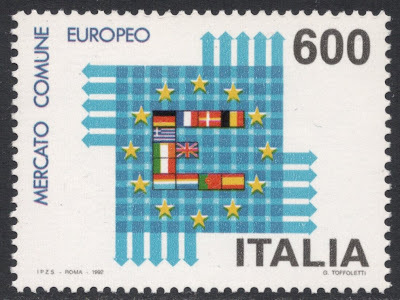 And at least it mentions the year (1993) in which the European Union would become operative, with all the other stamps mentioning the year (1992) in which the decision was made. 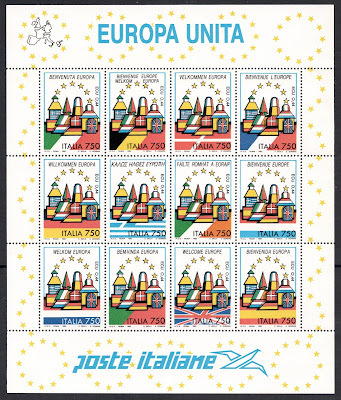 Italy got over-excited and not only issued a single stamp like all the other member countries, but followed that up with a whole sheetlet of different stamps for each of the twelve members. 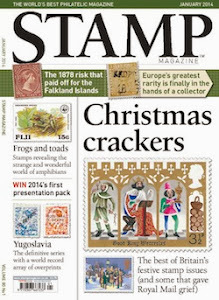 A bit over the top perhaps but as a unifying philatelic symbol it is okay, so we'll allow it. 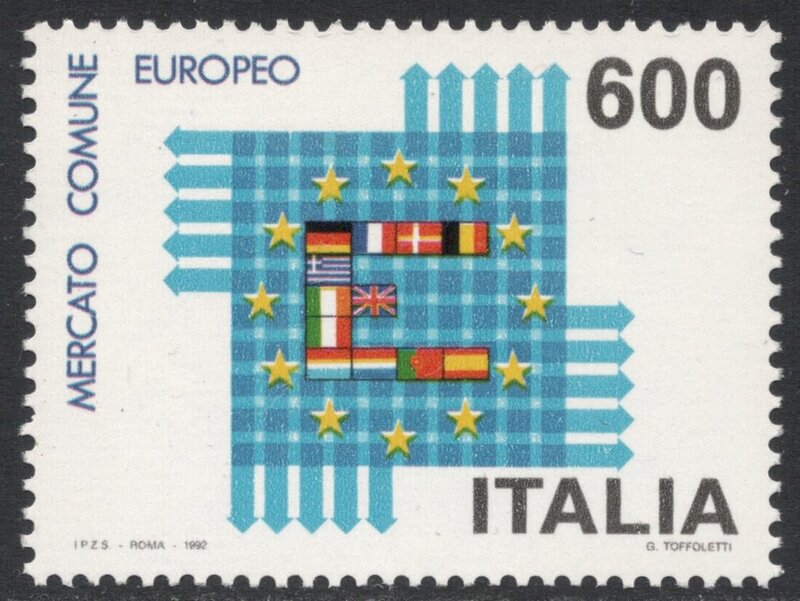 Especially since it has the added advantage of having the national flags and the words ‘Welcome Europe’ in the respective languages all included in the design which otherwise features a Europe constructed from a building block set. So at least we can spend a pleasant (half?) hour trying to figure all of them out! 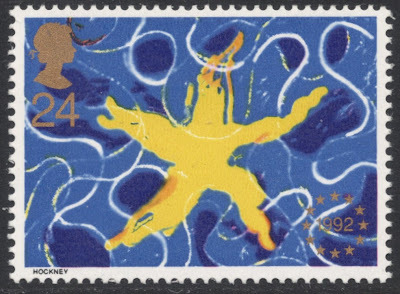 I like the Hockney stamp. Was not aware of it before reading this piece. ebay has them for around a pound. Would that mean a full sheet was only worth £100 then ? I think you'd be struggling to get £24 for a sheet of 100.